Tom Howe, managing partner at The Jefferson Group, looks at how B2B marketing is evolving, why it remains a vibrant and energetic sector to be part of and why relevance and authenticity are key to career success. Business to business marketers: ask ten of them to describe their profession and you’ll get 100 different answers. Better still their responses will come via Powerpoint, interactive ebooks and heavily laminated ‘battlecards’. So I didn't ask and instead sat back on my chair, puffed an imaginary cigar (Cuban), and ordered my thoughts. What follows could best be described as a literary tour de force, a stunning exposé, or utter nonsense. Only you can decide dear reader. So let’s get started. Generally speaking, B2B marketing has reinvented itself three times over the years. First came the focus on features (our motorbike has a 150CC engine); then the shift to benefits (140mph top speed); and now finally emotion (riding this bike releases your inner spirit/life is for the open road etc.). For the majority, B2B is about working with a product or service that offers few ‘key differentiators and sounds suspiciously similar to the competition. Relevance – which equates to the huge growth in account-based marketing, and the desire to offer tailored messages to specific companies. The growing number of agencies focusing on ABM (and ‘industrialising’ its output) demonstrates the success of the practice in delivering the meaningful conversations that clients want. Authenticity – which brings us to one of the latest industry buzzwords: storytelling. Combining emotion and context, storytelling helps relate a product to the audiences’ real-world experiences. Instead of eulogising the benefits of an interactive whiteboard for schools (for example), the storyteller looks to connect with a teacher’s hopes and ambitions – the very reasons why he or she joined the profession in the first place, and the feelings that emerge when they’re ‘winning’. These are (arguably) two of the biggest changes to agency offerings in recent times. They also show evolution at work within B2B, and how traditional ‘spray and pray’ campaigns are going the way of the dodo by failing to attract the attention of ‘time poor’ and skeptical audiences. It’s now time to address a few of the rather large elephants in the B2B room. The biggest of these I would term the force of ‘conservatism’, which can (and often does) lead to ‘tick box’ marketing – the "I’ll have a whitepaper, two emails, five social posts and a milkshake…" mindset. An approach that I believe only provides further ammunition to those who would present B2B in a bad light, or at least as the poor and impoverished cousin of B2C. Most agencies have these conversations with clients. Where restrictions are placed on their thinking; where the client’s ‘brand guardians’ rule supreme; and where the client falls into the trap of putting their own requirements ahead of the customer. Yes there are other pachyderms to address – the inhuman language of B2B that demands we ‘leverage ourselves for an agile and optimised something or other’ being one of them. But addressing this force of conservatism is, I believe, essential for the industry’s long-term prospects. Doing this starts with client education. I’ve long supported the view that B2B agencies have a responsibility to continually challenge their clients, to question their thinking, their reservations, and to help them understand what ‘good’ looks like. The biggest fear a business has shouldn’t be that they contravene and receive censure from internal ‘brand police’. It should be that their marketing only helps generate apathy – and that it fails to elicit any reaction from an uncaring external audience. Every B2B marketer I talk to knows that to break free from these artificial bonds is to unleash an explosion of fresh ideas and creativity. Every B2B marketer I talk to knows that to break free from these artificial bonds is to unleash an explosion of fresh ideas and creativity. Where B2C gurus (themselves increasingly held back by similar constraints), begin to cast envious glances at leading B2B brands. And what’s more, I firmly believe that the impetus for change is there. I take great joy in seeing many of the agencies I work with leading this change, and putting emotion at the centre of their play – and being prepared to say no to clients asking for the ‘same old’. Of course we still have to be watchful – storytelling, for example, is in danger of becoming another packaged commodity and forced to comply with standard operating procedure (for example, the craft of telling stories demands a more human language that’s relevant and recognisable to a reader’s day-to-day life, rather than having to accommodate a more corporate tone of voice). But I sense that more and more clients and agencies are becoming ‘woke’ to the need for change. Finally, there’s the question of whether the B2B industry represents a worthwhile (read: desirable) career choice. Of course as a recruiter and someone who started his career in B2B marketing, I’m going to offer a resounding yes. But I believe it too. As a discipline, B2B marketing remains a vibrant and energetic sector to be part of (certainly in the UK which remains a global hub of innovation and best practice). It’s also a sector that continues to transform itself through new digital capabilities. The agencies we work with are hotbeds of amazing talent. 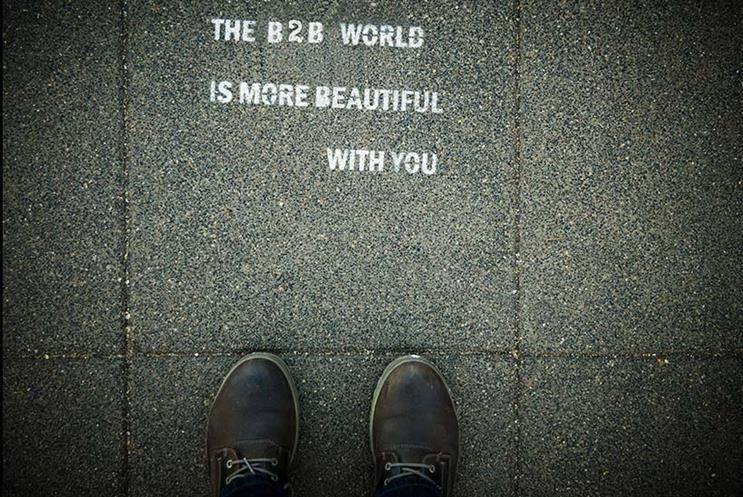 B2B is a great industry. Hope springs eternal. Equally, there’s the swarm (collective noun) of millennials entering the land of B2B and bringing with them new expectations for how to work and succeed. I’m also hearing agencies report that a growing number of clients are letting them off the leash. Particularly smaller challenger brands that recognise how the B2B market is shifting – and the possibilities this change offers for enthusing their marketing with greater spirit and personality. That should mean exciting times ahead, and breaking free from the final ‘chains of mediocrity’. The agencies we work with are hotbeds of amazing talent. B2B is a great industry. Hope springs eternal.